Hebrew Home is "home" to a great many - with a resident population over five times the national average with 558 beds. Sometimes, the bigger the facility, the harder it becomes to maintain consistent quality. 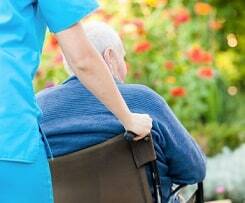 Our nursing home lawyers tend to file more lawsuits against big "factory-like" nursing homes. But for such an exceptionally large facility, Hebrew Home produces a very positive statistical picture. According to U.S. Department of Medicare figures, this nonprofit corporation scores above average for three of the four main studied categories: overall rating, health inspections, and staffing. Hebrew Home gets an average score on quality measures. In terms of staffing, Hebrew Home of Greater Washington beats the state and national averages for the amount of time residents receive daily from LPNs and LVNs (licensed practical nurses, licensed vocational nurses), certified nursing assistants, and physical therapists. This facility scores significantly below the state and national averages for registered nurse time per resident's day. However, in terms of all licensed nurse time per resident, Hebrew Home falls in right along with the state and national averages. Our nursing home lawyers have always believed that the state and national averages are way too low. For short-stay residents of Hebrew Home, the composite picture is very good. These residents experienced improvements in function significantly more often than the state or U.S. average (76.4 percent, versus 64.8 or 63.3 percent). The rate of rehospitalization of former short-stay residents was lower than both the state and national averages; significantly fewer of these former residents (than the state or national averages) needed an outpatient emergency department visit. The facility also has a very positive discharge rate: 71 percent were successfully discharged to the community, besting the state rate of 59.1 percent and the national rate of 55 percent. On the incidence of pressure ulcers (a potentially meaningful important indicator of the level of care given), Hebrew Home had less than half as many new or worsening cases than the state or the national average. (Although the most recent inspection report did raise a concern about how one patient was not being properly treated for bed sores.) Hebrew Home is above average on vaccinating residents for influenza and pneumonia, and also better in resorting less often to antipsychotic medications. For long-stay residents, the picture is less sanguine. These residents were more likely than the state or national averages to suffer a serious injury from a fall. They were more likely than state or national figures to have a urinary tract infection, and significantly more likely to have lost bowel or bladder control (although they were less likely to undergo ongoing catheterization). In one troubling statistic, this facility's long-stay residents were more likely to be subjected to physical restraints (1.4 percent, versus 0.8 percent nationally, and more than twice the 0.6 average in Maryland). Another troubling stat: 10.3 percent of long-stay residents showed symptoms of depression, well above the state (4.8 percent) and national (5.4 percent) averages. However, the facility falls into the middle range on administering antianxiety or hypnotic medications. Hebrew Home also was in the middle range, between the state and national averages, on long-stay residents' ability to maintain their mobility; and a bit above state and national averages in their ability to continue independently performing daily activities. The facility also has excelled, as we said above, on preventing pressure ulcers. Hebrew Home beats the state and national averages on preventing influenza and pneumonia - vaccinating nineteen out of twenty (or more) long-stay residents. Some of this data gives cause for concern but the most important thing to look at is the big picture. For example, Hebrew Home's data on physical restraints can make your stomach queasy. But is that a function of this nursing home taking the easy way out and putting the patient in restraints or are they just more willing to take on patients that need the restraints? The take home message is that you do not want to put too much emphasis on any specific data point. Instead, the reports should be viewed in their entirety. Two inspections of Hebrew Home in 2015 (a standard health inspection, and a separate complaint inspection) turned up 8 health deficiencies. On this score, Hebrew Home landed in the middle, in comparison with the Maryland (10.6) and national (7) averages. In terms of fire safety, Hebrew Home's latest Medicare score is worse than the Maryland and national averages (6 deficiencies, versus 3.9 Maryland state average, 3.3 U.S. average). Again, we go back to the scope of this operation. The facility's sheer size: 484 residents, with a capacity for 558. Whatever happens in such a facility has the potential to affect a seriously large number of people. It's good news, then, that Hebrew Home has not received any federal fines, nor any payment denials, for the past three years. Clearly, this is not a perfect nursing home by any stretch. But these inspections show that it is probably better than average. We do not have any information on lawsuits, settlements or verdicts involving Hebrew Home's nursing home. If this is correct (it is hard to find all claims), it is an incredible accomplishment. If someone you love has an injury as the result of Hebrew Home or any other nursing home, we can help you understand your options to received money damages for the harm that has been done. Please call our Maryland nursing home attorneys at 1.800.553.8082 or get a free online case review.